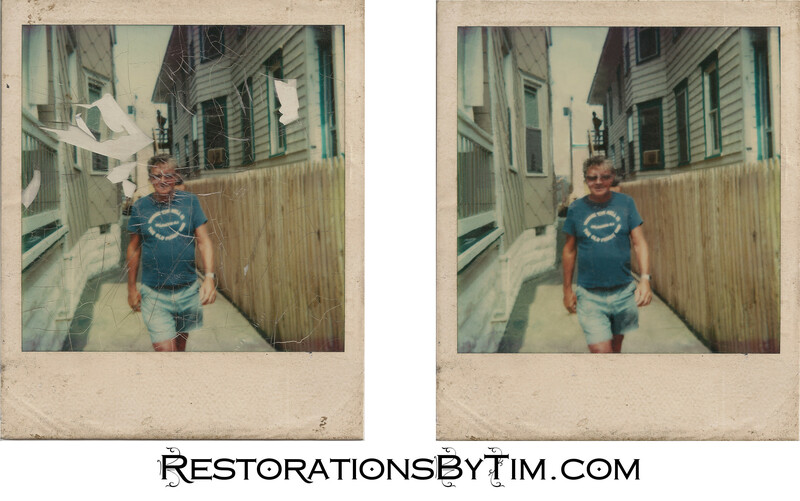 Major Restoration: New Challenges; Pervasive Cracking | Photo Restorations by Tim G.
This Polaroid will alter the way I think about pricing my work. It is the most extensive restoration I’ve done to date. Until now, the most extensive restoration I had done was this three-hour job, so I used three hours as my benchmark for this request. These cracks seemed a little more faint, as if they might wipe away a little easier. I also wanted the work, so I gave a quote of two hours at $21 and hour–a $42 job. Oh, how wrong I was. I intend to honor my quotes, even when they are this wrong. And they will often be this wrong when I take on experimental challenges like this. The lesson is: I like to take on new challenges. If you have new and interesting challenge for me, I will often give a low quote to make sure I get the job and the experience.